﻿Why would we turn down a job? One of the worst things about our business is not being able to help our customers - on the rare occasion. We often hear from disgruntled customers who we are unable to help, because their roof is beyond re-coating. We are very clear about what state a roof needs to be in, before it can be re-coated and when we encounter one that is beyond help, its a hard thing for the home owner to hear. We wont re-coat a roof that we cant apply our full warranty to - and sometimes that means the roof needs a full replacement. Unlike other companies, most of our Kowhai Guys do not re-roof, so there isn't anything in it for them to say no. Many companies who do both, will push for a re-roof, as it generally involves far bigger sums of money (3-5X the cost of a re-coat). Often people are after a quick patch up job as they intend selling, or are just wanting another couple of years life so they can budget to pay for a re-roof. Whatever the reason, we would be silly to re-coat something that isn't going to last, as who do you think gets the blame when the roof does finally give up the ghost? Yes - we can do a re-coat and contract out of all liability, should the roof fail in the short- medium term, but that doesn't alleviate the disappointment to the home owner, should the roof fail and they are faced with significant re-roofing costs, ahead of when they thought they would. The other thing to note, is that by simply getting on the roof and re-coating it, current damage can be amplified and the roofs end date is effectively "brought forward". 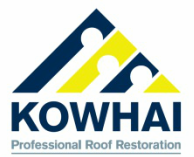 So if your Kowhai Guy turns down a job as he deems the roof not worthy of a re-coat, be very careful about simply ringing around to find someone who will do it. If you do find someone who is prepared to put their name to a re-coat in this situation, be meticulous in understanding their warranty conditions and what they will and wont do, in the event of the roof failing ahead of your expectations. Kowhai has been around for 40 years servicing NZ, backing up our work and fixing the work of others.......we will most definitely be around another 40 years doing the same.